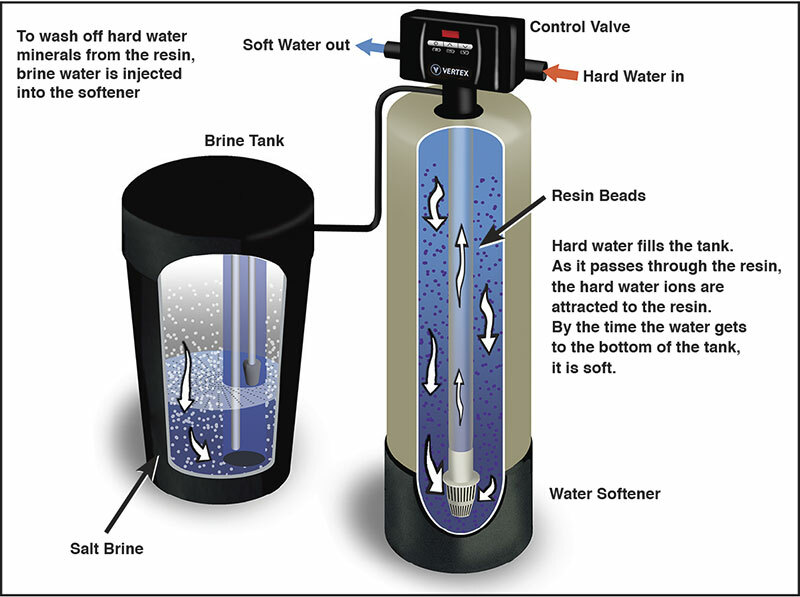 The water softener tank is filled with small diameter resin beads which are charged with sodium ions. When hard water flows through the resin bed, the beads act like a magnet, attracting the calcium and magnesium ions in the water in exchange for the sodium ions. 2. Eventually the resin beads become saturated with the hardness mineral ions and must be recharged. This regeneration process is conducted by the control valve on the top of the tank. The control valve is the brain of the system. 3. During regeneration, a strong brine solution from the brine tank is flushed through the resin tank, bathing the resin beads in a stream of sodium ions from the salt in the brine. This replaces the calcium and magnesium ions captured by the resin beads. 4. The brine solution carrying the displaced hardness minerals is flushed to the drain with fresh water. The resin beads can be used over again.